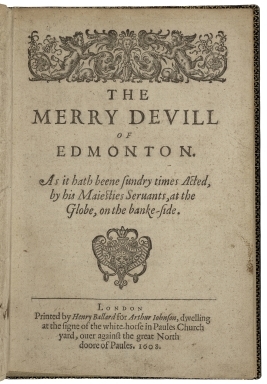 THE MERRY DEVILL OF EDMONTON. As it hath beene sundry times Acted, by his Maiesties Seruants, at the Globe, on the banke-side. LONDON Printed by Henry Ballard for Arthur Iohnson, dwelling at the signe of the white-horse in Paules Church yard, ouer against the great North doore of Paules. 1608.